New Report: The Next Pandemic Will Kill Millions, Cost Trillions — And We're Not Ready : Goats and Soda The French disease fighter had a healthy fear of microbes. So does a new report, which worries that humankind might not be ready to fight off the next pandemic. 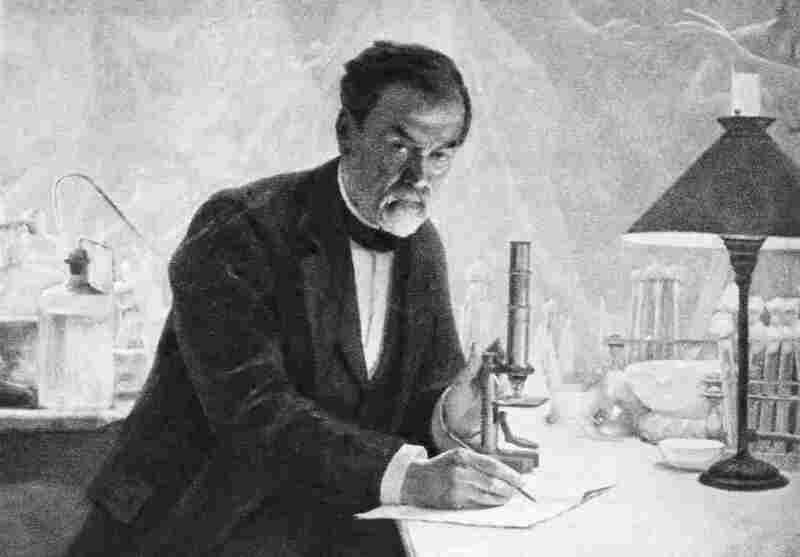 A painting of Louis Pasteur in his laboratory. The French chemist and microbiologist once said, "Fortune favors the prepared mind." A new report on pandemics bears a similar message. "Messieurs, c'est les microbes qui auront le dernier mot." "Gentlemen, it is the microbes who will have the last word." That comment from 19th century disease fighter Louis Pasteur is not what you'd expect to see at the start of a report from some of the world's top public health officials. But the report itself has a stinging message: We're not prepared for the next coming plague or pandemic — or HIV 2.0. That report, titled "The Neglected Dimension of Global Security," comes from a commission put together last year by the National Academy of Medicine. The commission says future pandemics have the potential to kill millions and cause economic losses in the trillions of dollars. "Pandemics represent a real threat to human security," says Peter Sands, the chair of the Commission on a Global Health Risk Framework for the Future. "They will happen and we need to be able to contain them." The report predicts that new diseases will emerge even faster in the 21st century than they did in the 19th. The commission of 17 public health officials from around the globe sums it up this way: "A range of factors, including increasing population, economic globalization, environmental degradation and ever increasing human interaction around the globe are changing the dynamics of infectious disease." "The alerts were raised too slowly. Local health systems were quickly overwhelmed. The international response was slow and clumsy," he says. "We lacked many of the medical products we needed, either therapeutic or vaccination or indeed even effective diagnostics." This report argues that the world needs to better position itself for the next pandemics. If the world were to invest roughly $4.5 billion a year, the authors estimate economic losses of $60 billion a year from future pandemics could be avoided. The bulk of the money would go to bolster health care systems in low- and middle-income countries. An additional $1 billion would be poured into medical research for potentially dangerous diseases. "We are much more connected not just physically but by media nowadays," he says. "Hearing about and seeing infectious disease outbreaks on TV can spread fear even more rapidly than the disease itself. That in turn can grow changes in behavior and policy which magnify the economic impact." The commission argues that the world ignores the threat of future pandemics at its own peril. "We need to step up our game," as Sands puts it — just as Pasteur did when he invented the first vaccines for rabies and anthrax.